Monday -Thursday: 10:00 a.m. - 4:00 p.m. The term "Ghost Winery" was given to the few remaining early Napa Valley wineries that were in existence between 1860 and 1900. Very few of these Ghost Wineries remain as the vineyards of most Napa Valley wineries were decimated by the phylloxera infestation of the 1890's. The economic depression of that decade was the final blow for many others. Over the years many fell into disrepair and were dismantled or absorbed into newer, more modern facilities. One rare example of a perfectly preserved Ghost Winery is the T.L Grigsby-Occidental Winery located on the Regusci Ranch. Built in 1878, the winery's handsome hand-cut stone facade, with its graceful arched windows, is crafted entirely from lava stone and has walls that are two feet thick. In 1995, Angelo Regusci and his son Jim decided to reestablish the winery, and in 1996 Angelo and Jim crushed their first vintage of Stags Leap District wines. This family-owned and operated winery opened it's doors in June of 1998 showcasing its estate wines. Regusci offers a relaxed, casual and strictly 'old school' tasting experience - we're farmers first and winemakers second. Regusci isn't so much a winery but more of a ranch. View from Tasting Room: Gorgeous! To join the wine club, visit www.regusciwinery.com or call 707-254-0403. Founders Level - Five to six bottles per release; includes current releases, library wines and wine club exclusive wines. Heritage Level - Three to four bottles per release; includes current releases and wine club exclusive wines. Family Level - Two to three bottles per release; includes current release wines and limited access to wine club exclusive wines. Membership benefits include access to limited wines, preferential case pricing, complimentary tastings and invitations to wine club exclusive events. Regusci Winery is certified under the Napa Green Winery Program by the Napa County Department of Environmental Management (DEM) and the Association of Bay Area Government’s (ABAG) Green Business Program and completed all the regulatory components needed for environmental sustainability. These components included developing water and energy conservation methods, preventing pollution, and reducing solid waste. In addition to developing sustainable winery practices, this program is set to become the standard for the state of California. Regusci Winery is certified under the Napa Green Certified Land Program. 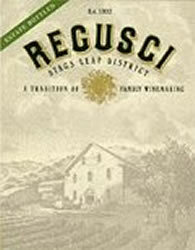 Regusci Winery has created and implemented a customized farm plan with measured results that addressed all aspects of its property, vineyard land as well as non-farmed land, including practicing soil conservation, water conservation, stable drainage, riparian corridor enhancement, fisheries and wildlife habitat enhancement and long-term improvement and sustainability.